Here in the midwest it’s officially strawberry season, which is rather exciting if you’re a fan of the bright red sweet and juicy berries. Me? I prefer mine with a big bowl of whipped cream and sans shortcake, but if someone was to offer me a slice of wedding cake adorned with strawberries I’m pretty sure I won’t turn it down. 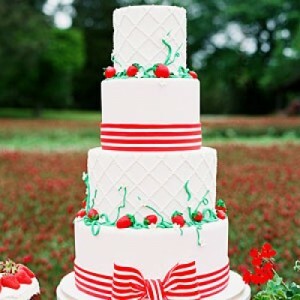 Especially if that strawberry wedding cake looked like this beauty! Sure, the strawberries on this cake are made from gumpaste, but I bet you could ask your baker to add fresh strawberries to your cake if they were in season. The fresh berries will probably work best if they’re added at the last possible minute – no one wants strawberry-stained icing! This four-tier cake is such fun with the bright red berries and the whimsical pinstripe bows. It would be absolutely perfect for your summer wedding. You can’t ever go wrong with strawberries! We found this summery, fun wedding cake here.